If you love to kill feral pigs and want to make a little cash, Guadalupe County in southwest Texas is the place to be. 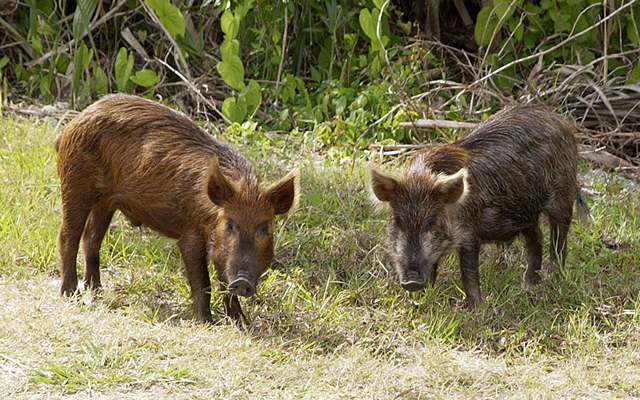 County officials have extended its feral pig bounty, which pays hunters $5 per tail when they're submitted under program guidelines. The county's commissioners extended the program through Sept. 30, 2019. That's 10 months longer than previously planned. As in several other states, feral pigs are wreaking havoc in Guadalupe County. Officials are trying to get a handle on the explosive porcine problem but it's challenging. "I think there's widespread support throughout the county," commissioner Greg Seidenberger said during the recent meeting to extend it. "Some people will say 'well it's only $5 a tail,' but other people say, 'yeah, but if I shoot a few pigs, I can pay for my shells.' I think we're going to see increased participation." The bounty was offered in July 2018. Officials wanted to see at least 2,000 dead hogs and got up to 300 by the end of August. With extra money in the coffers, the county commission decided to extend the program. MySanAntonio.com reported that grant money was provided by the Texas A&M Agrilife Service for feral hog control and other projects. "It seems like (the program has) been beneficial," County Judge Kyle Kutscher said at the meeting. "There's going to be peaks and lulls, but the funds were minimal in the county budget (and) for an important use, and that's what they were intended for, so it makes sense to continue."